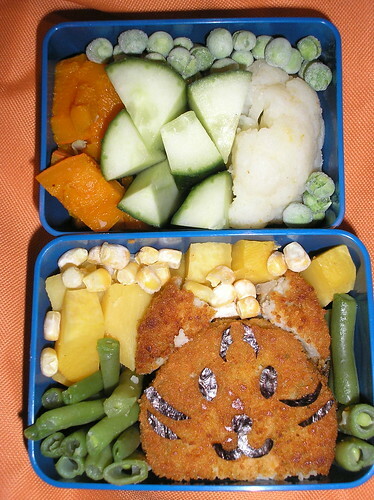 I planned this bento last week, when we had to switch off the computers while the server got restarted. My little tiger looks more like a tabby cat. It is made of a fish patty. The nori for the stripes were hard to apply, they just didn't want to stay where they should. The rest of the box contains swede, corn, green beans, red kuri squash, cucumber, peas and cauliflower.